Unless Elon Musk and Richard Branson get their lunar skates on, most of us won't get to explore space in our lifetimes – though many of the developments made in planetary exploration benefit us here on the ground today. In fact, some of the technology we use on a daily basis, like the CMOS active pixel sensors found in smartphone cameras, are indebted to space research. Even aural thermometers use infrared sensors that were first created by NASA for measuring the temperature given off by stars. When it comes to health and wearable technology, we're also going to reap the rewards, but it's a two-way street. At this year's SXSW a handful of companies were summoned to pitch their ideas to the Translational Research Institute for Space Health (TRISH), which is NASA's venture arm for astronaut health. Dorit Donoviel, director at TRISH, was in Austin to scout out potential new technologies that could solve the problems of space. It was a pretty open brief, but with a few important stipulations: the technology must be portable, durable, minimally invasive and low-power. "[Astronauts] are stuck in a tin can for two to three years, going on a deep space exploration mission. They may not have access to all the healthcare we take for granted today, we know they won't," said Donoviel. "We have to design a way to keep these folks healthy for two to three years with very limited resources. Murphy's law will say that the one guy who gets sick is going to be the doctor." Munich-based startup Cosinuss is all ears. The company, which pitched its idea to NASA at SXSW, makes a hearable called the Cosinuss One for monitoring heart rate, heart rate variability, body temperature and oxygen saturation. 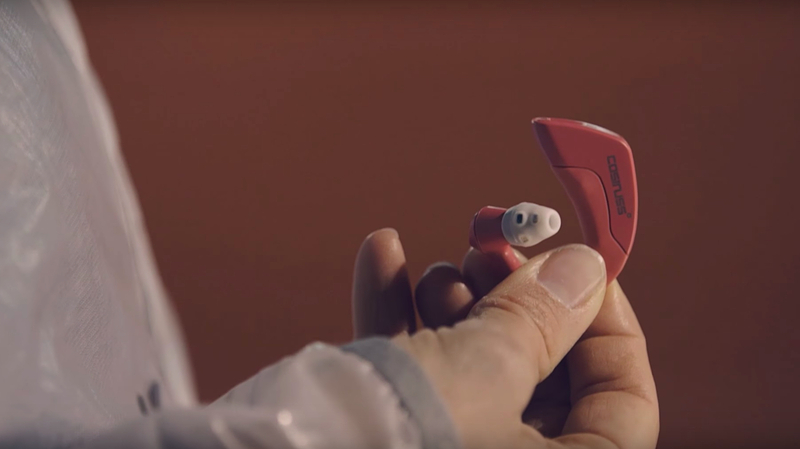 Its second device, the Cosinuss Degree, will be a continuous in-ear thermometer for children, arriving this summer, while it also has its sights on hearables to detect stress and sleep apnea, as well as one specifically for elderly care. But its tech might also find a place among the stars. "One important thing is to have a very small device, because everything is about size and weight for astronauts," Cosinuss CEO Johannes Kreuzer tells Wareable. "If they are getting ill, they can put it in – we call it a doctor in your pocket – and it can measure several vital signs." For astronauts walking on the moon, or even planets beyond, a device like this could offer invaluable insights into the physiological effects on the body. "NASA are interested and they want to test it," says Kreuzer, a few days after the pitch. "There are a lot of things that we've never had to think about, because they were asking about what happens when you have no pressure? Can it explode? A lot of things we weren't thinking about until now." As we know, when it comes to tracking vital signs, the ear is hard to beat. According to Kreuzer, the Cosinuss One can measure heart rate within 1bpm of accuracy within the 50bpm-180bpm range, while temperature has a plus/minus accuracy of 0.2 degrees celsius. "One big use case is athletes and sportsman who want to monitor the heart rate, and most of the athletes hate the chest strap, which is very good for us," he says. "The wrist bands from Fitbit, Jawbone, Apple and so on, they have a problem with accuracy when you're sweating and moving." The Cosinuss One can even track blood pressure when used with a paired ECG chest strap, says Kreuzer, who quotes an accuracy of within 1%. He adds that the company is also tapping into other industries that could benefit from this technology, including sailing teams, pilots and remote workers in hazardous environments. "A big use case is worker safety," he says. "Like lone workers in the field who have to do maintenance, in a risky area for example, working with high voltage generators and stuff like that. And for this we're monitoring to see if they are stressed or if their temperature is too high." Cosinuss is currently working with Formula One drivers as well, to find a way of integrating its tech into protective headgear that would still allow drivers to radio-communicate. "We have different markets but all of them have the same need: they want to monitor real vital signs, with high precision, with medical precision, and they don't want to wear chest straps or ECG electrodes or anything like that." Kreuzer says the company has sold around 10,000 units of the Cosinuss One to date, but is still in the process of obtaining CE and FDA approval. Until that time it will continue to sell its hearables as non-medical devices. And, quite possibly, prepare to find a purpose beyond this world entirely.